The Unity Vive Input Utility reports AngularVelocity for tracked devices, but it‘s not documented in what units this Vector3 is. It does not seem to be the same units as Unity‘s Rigidbody.AngularVelocity, which is in euler angle radians per second. So the question is, how does the AngularVelocity Vector3 reported by the Vive Input Utility express angular velocity? And second question: can acceleration and angular acceleration also be queried? I have worked out so far that for slow rotations, angularVelocity reported seems to be very accurately represented as Axis around which the rotation happens (in world coordinates) and the length of the vector encodes half-radians per second (why half radians? no idea, but I need to multiply by 2 to get correct results). However, when rotating the controller just slightly faster, values reported become bogus. If I log out the magnitude of the reported vector, I can see that it seems correct as long as the rotation I apply results in a vector magnitude smaller than 1.0. However, as I exceed an angular velocity for which the magnitude of the vector would be 1, magnitude reported becomes smaller again and the vector unusable. This seems to be a bug! Here is a video of this. The red graph plotted is the magnitude of the angularVelocity reported. You can see that as long as I rotate the controller slowly, the cube to which I apply the reported angularVelocity rotates the same way as the controller. But as soon as I exceed this half radian per second angular velocity, the rotation applied to the cube doesn't make sense anymore. It's not just that the magnitude would be clamped to one - as soon as it should exceed 1, values reported don't make sense anymore. Uploaded by Matthias Bühlmann on 2018-04-26. Note: If I retrieve the angularVelocity through the deprecated Unity SteamVR Plugin, it works fine (there the units reported however are radians per second, rather than half-radians per second). But the Angular Velocity in the new Input Utility does not work correctly. To clarify a bit, are you using the SteamVR plugin with the Vive Input Utility plugin? There are a few features that require the SteamVR - it seems this is one of them. 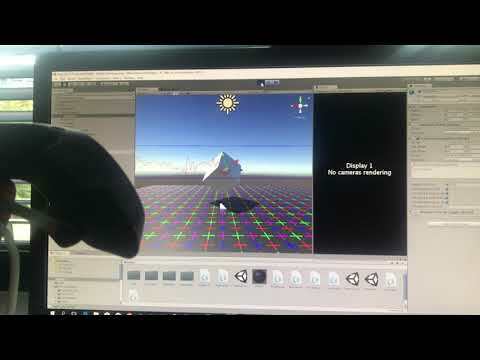 When Vive Input Utility detects the SteamVR plugin it will use that otherwise it will fall back to using the Unity native support for OpenVR, Oculus, Daydream, WaveVR, Microsoft... etc.